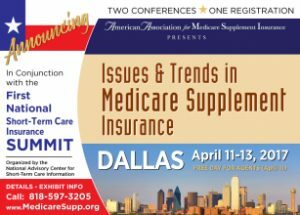 Free access to attend the leading national conference focused on Medicare Supplement insurance and senior insurance products is being offered by the American Association for Medicare Supplement Insurance. “We are pleased to offer free admission to insurance agents and financial advisors interested in learning more about Medigap insurance and other insurance products for seniors,” explains Jesse Slome, director of the American Association for Medicare Supplement Insurance (AAMSI). The special free agent day takes place on Tuesday, April 11, 2017 immediately before the commencement of the Ninth National Medicare Supplement Insurance Summit. The conference takes place April 11-13, 2017 at the Sheraton Hotel in Dallas. “There will be some 30 different sessions featuring top national experts coming to Dallas from around the country,” Slome explained. The Association that organizes the national industry conference makes entry available at no charge as a benefit to insurance agents. “Anyone can attend for a few hours or take part in the entire day,” Slome notes. Access includes entry to the exhibit hall where some 80 companies will be present. Agents can earn up to two hours of continuing education credit as part of the program. “This year we have expanded the content to include senior insurance products including dental insurance for seniors and other products that are suitable for individuals on Medicare,” Slome adds. A link to request the Free Pass can be found on the website page. Slome announced that only four exhibit spaces remain available at the 2017 conference. “We anticipate anywhere from 400 to 600 agents will attend the free day,” Slome shares. “This is a great opportunity for companies that want to gain some outstanding exposure.” For information call the organization at 818-597-3205.